The MCDS-Therapy clinical trial is now open! You are here: Home / Blog layout option 1 / News / The MCDS-Therapy clinical trial is now open! Recruitment begins in the UK! 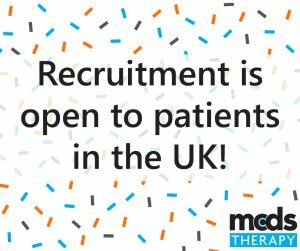 We are delighted to announce that MCDS-Therapy is now recruiting patients in the UK. We know that many people will have questions about the MCDS-Therapy clinical trial, and we have tried to answer the big ones below. The study aims to test the effect of the drug carbamazepine on MCDS patients. Ultimately, we are looking to see if the drug can help to reduce the malformation of the bones in the legs and reduce pain. How will the study progress? Patients enrolled on our trial will first be monitored for 12 months with no treatment provided. This will create a set of base-line data that tells us how MCDS is affecting them. This base-line will act as their control in the trial. After baseline data is collected, they will then be prescribed carbamazepine for 24 months, and its effect on the condition will be measured. Recruitment is starting in the UK, where our initial baseline observations will be followed by a period of time to work out the best dose of the drug to give to MCDS patients. Currently only one UK site is recruiting patients into the study: Newcastle Hospitals. The Evelina London Children’s Hospital will be joining the study soon. Keep an eye on our news page and twitter feed for updates on the opening of these new sites in early 2020. Currently, patients can only take part in the trial after being referred to an active trial site by a clinician at one of our identification centres. We are not recruiting patients into the trial online, patients entering the trial will initially discuss the trial with their doctor.